SINGLE DRAWN HAIR is quite simply hair which contains a multitude of lengths and is totally the opposite of double drawn hair. 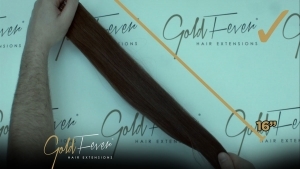 (Double Drawn Hair is where Gold Fever, with a specialised two step manual process, has drawn out all the short regrowth hair and their split ends). This Single drawn hair will refer to hair which has not necessarily been cut from a donor and could include brushed hair collected from people forced to sell it in impoverished villages (more about this mentioned in Remis – Dont be misled“). It includes individual hairs of all lengths since it would contain hairs of regrowth as well as hairs that the donor would have had growing for several years. This hair is easily identified by the fact that the thickness of a quantity of this hair at the root end would be substantially greater than the thickness at the far end. The majority of hair extensions of many methods are mainly single drawn hair. Single drawn hair will be considerably less expensive than double drawn hair. CONTAINING LARGE QUANTITIES OF HAIR WHICH IS MUCH SHORTER THAN THAT WHICH IS ADVERTISED. SINGLE DRAWN HAIR CANNOT PRODUCE AN EVEN VOLUME EFFECT FROM ROOT TO ENDS IN AN EXTENSION SERVICE. 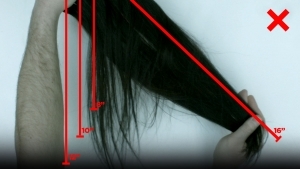 PRACTICALLY ALL OF THE HAIR IN THE STRAND IS OF THE SAME LENGTH. THIS MEANS THAT VOLUME AT THE TOP OF THE STRAND IS THE SAME AS THAT AT THE BOTTOM. CREATING A BALANCED VOLUME EFFECT FROM ROOT TO ENDS IN A QUALITY EXTENSION SERVICE.